Hello buddies! 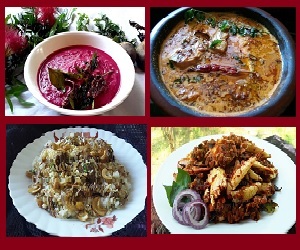 Weekend calls for making simple yet special recipes full of flavors and zest that will make your day special! So here is one gem from my Mom’s old cookbooks from the 1980s. 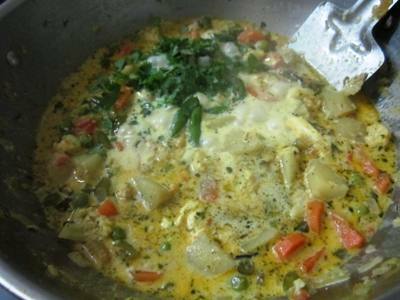 It’s called the Vegetable Malai Korma. This dish is not only rich, subtle and flavorful but also nutritious! 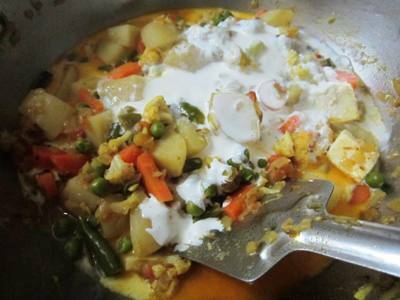 Since there are so many vegetables, it makes a healthy side dish with rotis for your kids. If you are looking for easy dinner ideas, this one is a must-try recipe. 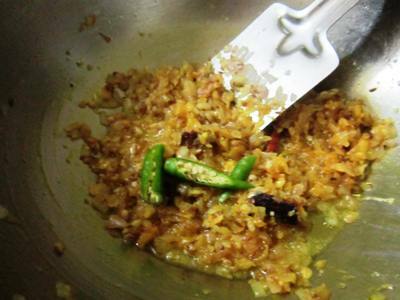 The malai or cream tones down the heat of the spices and gives a silky smooth texture to the dish. 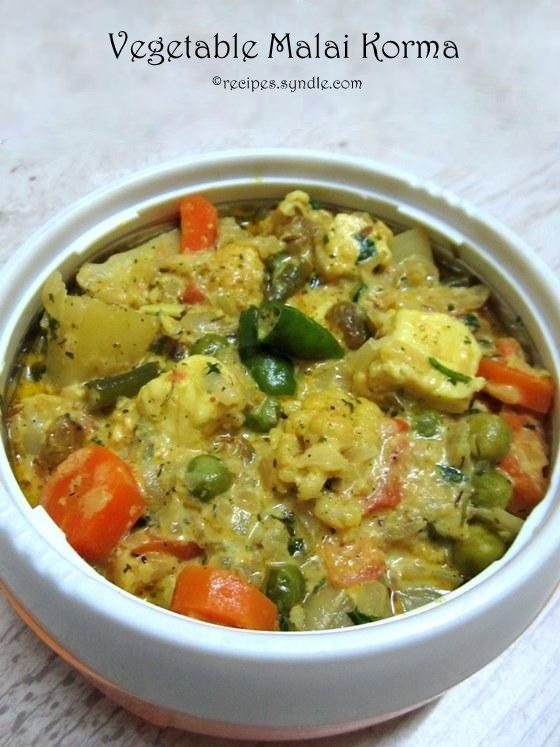 This is basically a dry korma with little gravy to coat the veggies. Not soupy or overly heavy, this dish can be made when you are hosting a dinner party! It will certainly woo your guests and send their taste-buds on a ride of bursting flavors! 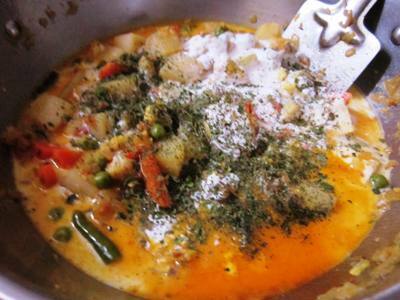 Now let’s start with the recipe of Vegetable Malai Korma. This one has a thick creamy gravy. 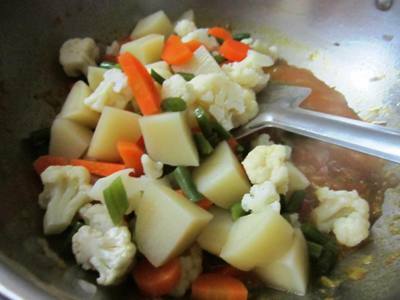 I have added my favorite veggies here; English carrots, green peas, potato, cauliflower and french beans. You can add baby corn too. But I suggest not adding capsicum. Its strong flavors happen to shadow the glory of other vegetables. So avoid adding any capsicum. I have added some paneer because my Dad loves it. You can add tofu if you are health conscious. This recipe is certainly a bit high on calories. But then we don’t make this kind don’t heavy food every day. Exercising and eating healthy on the other days helps balance the calorie intake throughout the week. So, for the purpose of measurement, 1 cup = 250 ml. This recipe yields 4-5 servings. 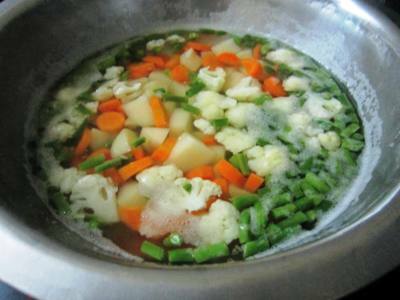 Parboil the carrots, potato, cauliflower and French beans together in a pot with sufficient water and little salt. This will take about 10 minutes. Drain the veggies and reserve the stock. Parboil the green peas separately. Discard its water because it has a unpleasant, raw smell. 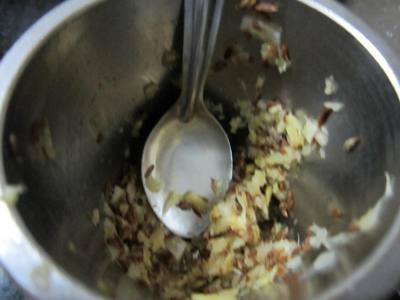 Pound together the ginger, garlic and roasted cumin in a mortar and pestle. Keep it aside. 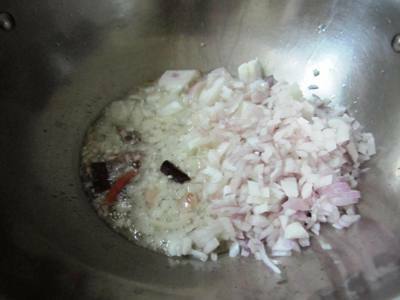 In a skillet, heat the ghee and oil together and add in the cinnamon stick and onion. Saute the onion till it starts to turn golden. 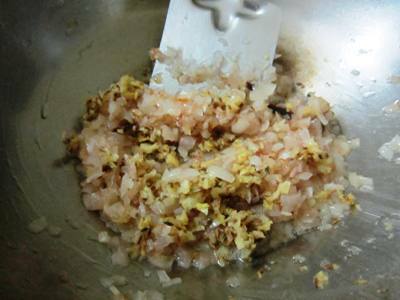 Add in the crushed ginger-garlic-cumin and saute for another minute till the raw smell goes away. Add in the turmeric and mix. Saute for another minute. Add in 3 green chilies at this stage and saute for a minute. Add in the blanched chopped tomatoes and salt. Cook till the tomatoes get mushy. 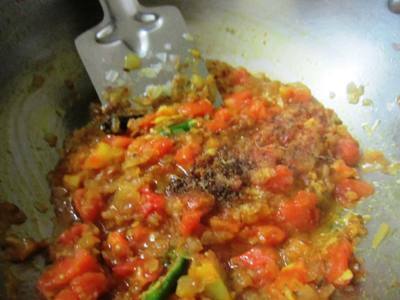 If the mixture gets too dry, sprinkle some vegetable stock. 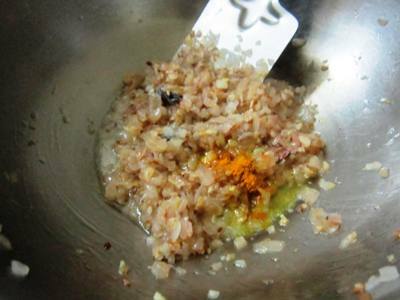 When the ghee begins to separate, add in the garam masala powder and mix. Add in the all the veggies, except the peas and saute them for 5 minutes. Sprinkle some vegetable stock while doing. 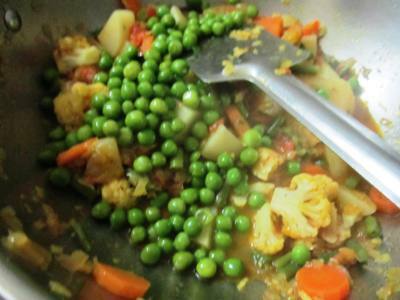 Then add the peas and some vegetable stock and allow the veggies to get cooked completely. Do not overcook the veggies. We need them to remain whole and retain the crunch. The stock will have almost evaporated by now. 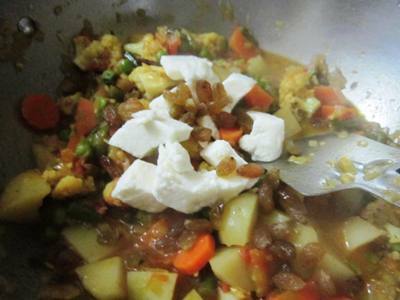 When the veggies are done, add in the paneer and cashews and raisins stir. Add in the fresh cream and milk. Add in the kasoori methi. Mix well. Allow the gravy to simmer and thicken till everything is nicely hot and mixed up well. Check the salt. 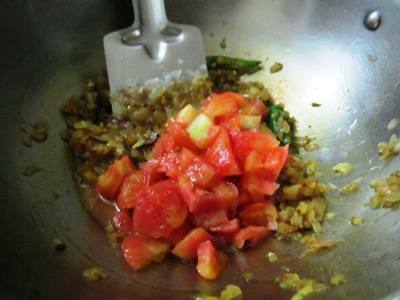 Add in the chopped coriander and the remaining green chilies. Switch off the flame after 3-4 minutes. The gravy will thicken and coat the veggies. 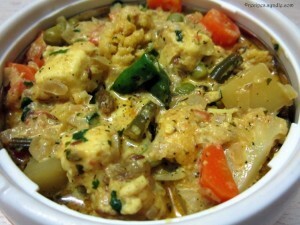 Vegetable Malai Korma is ready. Enjoy hot with rotis. Tastes even better the next day.